What is ORS used for? 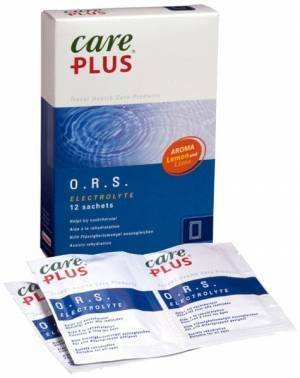 ORS (Oral Rehydration Solution) sachets contain rehydration salts and sugars. The solution is used to replace body fluids lost as a result of excessive sweating, vomiting or acute diarrhoea. The content of the sachets is dissolved in water and consumed. ORS is available without a prescription and comes in convenient sachets. Excessive sweating, severe diarrhoea or vomiting makes you lose more fluids, and thus also salts and sugars, than you usually would and can make you dehydrated. Dehydration is characterised by increased thirst, dry eyes and mouth, drowsiness, less or no urination, confusion, and in severe cases, fainting. Infants, small children, pregnant women and frail or elderly people are more prone to dehydration when there is excessive loss of fluid. ORS prevents dehydration. The sugars and salts in the sachets help the water to be absorbed from the intestines and restore moisture balance in the body. For treating severe diarrhoea, one sachet after each loose bowel movement is recommended. The contents of the sachet should be dissolved in 200 ml of fresh drinking water. The solution can be consumed in one go or taken in sips over the course of the day. ORS can be kept in the fridge for up to 24 hours after it is dissolved. Infants should be given the solution before the breast or bottle. Don't dissolve the sachets in anything other than water (i.e. not in formula or breast milk). Continue to use ORS for as long as you have diarrhoea. Seek medical advice if the diarrhoea lasts for longer than three days or is accompanied by fever or blood in stool. Consult a doctor if infants under two years or elderly people above 70 years still have watery diarrhoea after one day of using ORS. To prevent dehydration: 10 ml of ORS per kg of body weight after each loose bowel movement. To treat dehydration: 10 ml (adults: 10 to 20 ml) of ORS per kg of body weight until the lost fluids are replaced (usually four to six hours). ORS normally has no side effects because it contains salts and sugars that are also in food. In the unlikely event that side effects do occur, contact your doctor. You have a decreased kidney function. This medicine contains sugars and salts. Consult a doctor on the use of ORS if you have diabetes or are on a low-sodium diet. ORS can be used safely by pregnant and breastfeeding women, provided the maximum dose is not exceeded. This medicine does not interact with alcohol or affect your ability to drive safely.